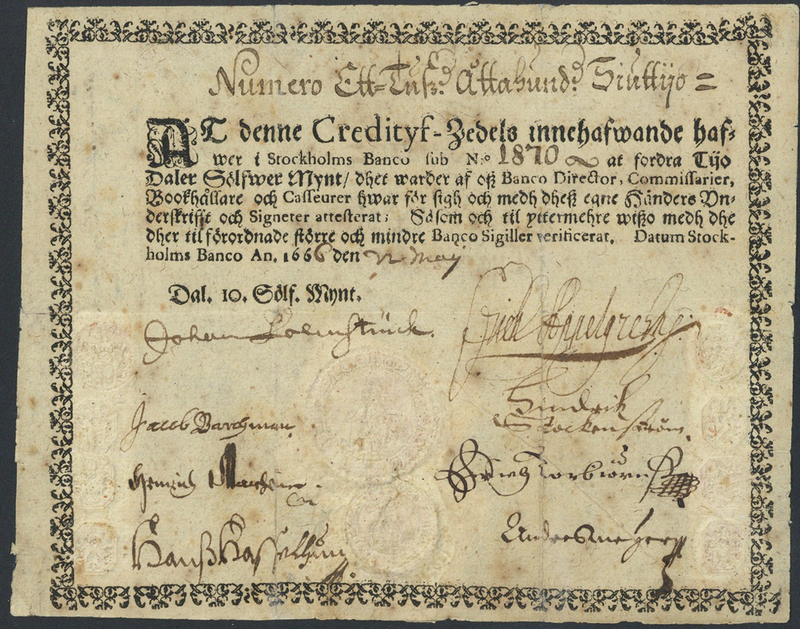 In its World Banknotes auction on January 13 in New York Spink is offering a monetary landmark: an example of Europe’s first paper money, the Swedish Palmstruch of 1666. Issued by Stockholms Banco, this is a 10 daler silvermynt, third issue, with the serial number 1870. It is estimated at $25,000-30,000. Three hundred and fifty years ago, not only was London burning down in the Great Fire, but paper notes as we understand them today were all but unknown. The year 1666 is also when the venerable auction house Spink can trace its origins to. In its World Banknotes auction on January 13 in New York it is offering a monetary landmark: an example of Europe’s first paper money, the Swedish Palmstruch of 1666. Issued by Stockholms Banco, this is a 10 daler silvermynt, third issue, with the serial number 1870. It is estimated at $25,000-30,000. In 1656 Johan Palmstruch was granted a Royal Privilege to found a bank. Sweden was in considerable financial trouble largely due to the Thirty Years’ War and the prevailing copper currency in circulation was cumbersome and impractical. Copper currency was deposited at the bank and paper issued. On the note, boldly sweeping black text on cream parchment-like paper reads “the Bearer of this credit note has a claim upon Stockholms Banco numbered 1870 for 10 dalers silvermynt is attested by us, the Bank Director, Commissioners, Bookkeepers and Cashiers of the Bank each by his signature written with his own hand and by his seal; as well as authenticated for additional security by the large and the small Bank Seal intended for such purpose”. Spink is holding five numismatic auctions in January and many of them will be taking place during the New York International Numismatic Convention Coin Show at the Waldorf Astoria Hotel. The January 13 sale is the first. As for British banknotes, bankofengland.co.uk states: “In the 16th century the goldsmith-bankers began to accept deposits, make loans and transfer funds. They also gave receipts for cash, that is to say gold coins, deposited with them. These receipts, known as ‘running cash notes’, were made out in the name of the depositor and promised to pay him on demand. Many also carried the words ‘or bearer’ after the name of the depositor, which allowed them to circulate in a limited way. “In 1694 the Bank of England was established in order to raise money for King William III’s war against France. Almost immediately the Bank started to issue notes in return for deposits. Like the goldsmiths’ notes, the crucial feature that made Bank of England notes a means of exchange was the promise to pay the bearer the sum of the note on demand.